Michel Gerard, one of the leading French artists, was born in Paris in 1938. He studied in Ecole Nationale des Arts Appliques and Ecole Superieure des Beaux-Arts in Paris. He began exhibiting his sculpture and drawings in the early 1970s and then his work started to enter private and public collections. 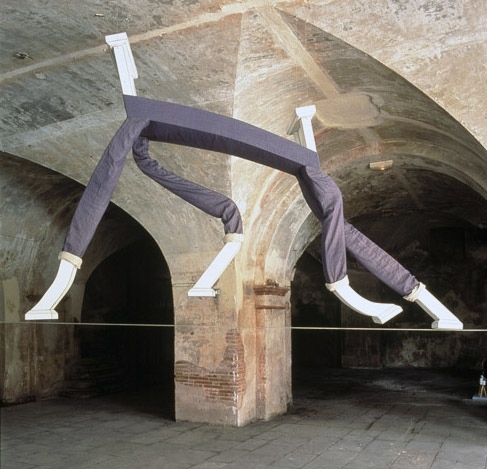 He experimented with the meaning of public art and the "status of statue" and later, in the 1980s, he created several large-scale public art projects in forged steel on the decline of industrial era. He moved to New York in 1989, and the city provided new resources and materials for his work. In the last ten years he worked with memories of his childhood in occupied Paris during the Second World War making multi-media installations. He had more than fifty solo exhibitions in the galleries and museums in Europe, the United States, Japan, Korea, and Israel. His work has been exhibited internationally and is held in the collections of: the Musée National dArt Moderne, Centre Georges Pompidou, Paris: Musée Municipal dArt Moderne, Paris; Bibliothèque Nationale, Paris; Musee dart ancien et contemporain, Epinal, France; Ixelles Museum, Brussels, Belgium; Ludwig Museum, Koblenz; Stadtische Kunsthalle Mannheim; Bremen Kunsthalle; Wilhelm Lehmbruch Museum, Duisburg, Germany; Galeria Degli Uffizi, Florence; Fattoria di Celle, Pistoia, Italy; Everson Museum of Art, Syracuse, New York; Arkansas Center for the Arts, Little Rock, Arkansas; Harvard University Art Museum, Cambridge, Massachusetts; Yale University Art Museum, Connecticut; Berkeley Art Museum; Pasadena School of Design Sculpture Park, California, among others. His large-scale outdoor sculptures are installed on public places in France, Unites States, Germany, Korea, Italy, Israel and Greece.